What do you do when 180-pound moose calf invites himself into your kitchen? How do you settle a bet over the exact size of a ferret? What do you do when you find an injured animal? For many Montanans the answer is simple. Call Vince Yannone! Vince is one of the most recognized and popular personalities in the state. His native wit and sense of humor have made him a local legend. Many Montana children have grown up watching Vince on TV and listening to his classroom presentations. Although he has retired from Montana's Department of Fish, Wildlife and Parks he remains a favorite speaker in Montana schools. 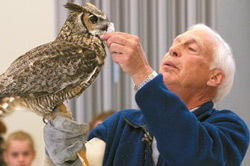 Vince began teaching children almost a quarter century ago when he developed the Fish Wildlife and Park's youth education program. The praise soon followed. Shortly after Vince was hired, a student's father called the FWP's director and said his child came home after one of his presentations "more enthusiastic than ever before." An elementary teacher described how a quiet schoolboy changed into a bright and eager student after a talk by "that guy" from Fish and Game. Later in his career Vince worked hard to establish "Project Wild" as part of the elementary and secondary curriculum in Montana. Vince says, "This is education; this is conservation. We have to start with kids and teach them how, and not what to think." His goal is to give children the opportunity to bond with nature and think things through. Vince's gift for communicating with people of all ages and from all walks of life is well known, but that gift sometimes overshadows his deep compassion for wildlife. His tireless efforts to place orphaned or recovered eagles, bears, birds, foxes, mountain lions, deer, antelope, elk and moose from FWP's animal shelter has gone virtually unnoticed. His recent experiment to induce orphaned bear cubs to enter an artificial state of hibernation so they could be better placed in dens in the dead of winter has proven to be remarkably successful. Vince has also cared for injured and orphaned animals from his Clancy home with the help of his wife Sue and his two daughters Jennifer and Christine. On behalf of FWP, Vince crisscrossed the state presenting wildlife programs and had his own daily television show. Since his retirement he has acquired a much larger audience. Among other activities he writes a wildlife feature for Montana Magazine, appears on the Discovery Channel and works for the Rocky Mountain Elk Foundation.